Fly in to Port Blair Airport. Our representative will meet and assist you at the Veer Savarkar Airport. Board the waiting vehicles, drive to your hotel and check in. First half of the day is at leisure. Later in the afternoon proceed for visit to Cellular Jail followed by light and sound show. Overnight stay at respective Hotel / Resort at Port Blair. After breakfast get transfer to Phoenix Bay Harbor to catch a ferry to Havelock. The Island (often just called Havelock) is one of the most beautiful and largest islands of Ritchie's Archipelago and is a placid heaven like no other. It hosts two of the world’s most renowned beaches; Vijaynagar Beach and Radhanagar Beach. On arrival the cab will be provided to pickup and drop guest to Beach No 7, Radhanagar beach rated as the best beach in Asia. Spend the day relaxing on this beach. Later proceed to selected hotel. Stay here overnight amongst sandy beach and lush green forest in a comfortable beach resort. 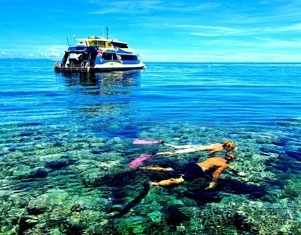 Trip to Elephant Beach3: Note: Inclusive of snorkeling equipment and car pick up and drop to jetty. Mud Valcono (Jalki): The mud volcanoes have erupted so sporadically with recent eruption I n 2005, believed to have been associated with the 2004 earthquake. The natives of this island call it “Jalki”. The mud volcanoes squirt little fountains of mud.